Pilsbury House Farm, on Hall Lane,near the church. Crowtree Farm, in Hall Lane,opposite Oaks Road. Dale Farm, on the road to Findern. Brook House Farm, by the 'Molly' was Calder Aluminum Labs demolished 2009. There was a group of farm buildings just through the bridge arch on the Twyford Road. In 1947 these were converted and made into a small workshop making agricultural machinery and equipment by Mr Fryer, Mr Clayton and Mr Collins, who bought the buildings from Mr Blackett at Pilsbury Farm. This business continues to operate up to 2008, initially owned by Mr and Mrs De Vallis, as Acres Engineering. This has now ceased trading in the village. Pilsbury House Farm was so named in 1900 when a Mr Gould, from Pilsbury in north Derbyshire, took over the tenancy. Previously it had been called Acacia Farm, there being several old acacia trees in the gardens of the house..
Sycamore Farm , off Repton Road, just after it ceased working in 1997. Sycamore Farm, on Repton Road, was a working farm until 1996. 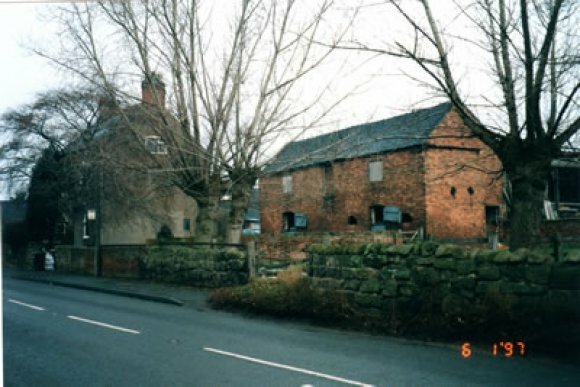 The adjacent farm buildings were demolished early in 1997 and Sycamore Close built on their site, although the farm house survives. Dale Farm on the Findern Road is also known locally as Spalton's Farm, after Jack Spalton who farmed it in the 1950's. Jack was Chairman of the Parish Council for many years. In the 19th century it was famed as a horse stud farm. This is the last working farm in the village, still is being operated by his daughters Joan and Janet.